At a news conference Thursday afternoon, St. Louis District Engineer Greg Horn with the Missouri Department of Transportation said major roads such as Gravois, Olive and Lindbergh will also soon face deterioration because they are no longer receiving full maintenance due to budget constraints. The same day the report was issued, the Missouri Senate voted 18-13 to give initial approval to raise the state's tax on diesel fuel by 3.5 cents and its tax on all other fuel by 1.5 cents. Currently, the tax on fuel is 17.3 cents and hasn’t been raised since 1992. The debate, which lasted more than four hours, pitted some Republicans against each other. The sponsor of the bill, Sen. Doug Libla, R-Poplar Bluff, said Senate Bill 540 doesn't make a big impact, but it will allow the state to continue to receive matching federal transportation funds through 2017. Other Senate Republicans, such as Sen. Rob Schaaf, R-St. Joseph, and Sen. Ed Emery, R-Lamar, didn't want to pass a tax without voter approval. Voters rejected a three-quarter cent sales tax to fund transportation in November. "We can't just paint our transportation issue with one big brush," Libla said. "It's going to take some more ideas. This is not the fix-it-all. But ... it keeps us to be able to stay afloat … access the $800 million that’s at the federal government." Libla's original bill called for a 2-cent raise each year for the next three years. It was then amended to a flat 2-cent raise earlier this month. On Thursday, Schaaf proposed an amendment that would make the tax go to a statewide vote, but later withdrew it. "I don't feel that it's up to me to decide to make people give up another $70, $80 million when I already have been told they don’t want it," Schaaf said, referring to November's vote. "They voted very clearly. People feel like the government gets enough out of them." Schaaf then offered an amendment that creates the 1.5- and 3.5-cent raise. The amendment would establish a commission that would create a toll-road proposal for the state. The bill now goes to fiscal oversight to determine its potential cost. The state's Department of Transportation has already started to face budget problems this year and has struggled to maintain some bridges. 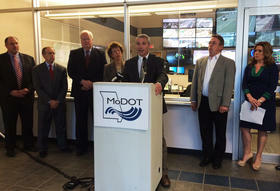 It has also forced MoDOT to scale back its road maintenance. Sen. Jason Holsman, D-Kansas City, -- in an echo of what officials were saying in St. Charles -- said the lack of transportation funding could have serious implications for Missouri's economy. "We need to understand the impact on the economy that a crumbling transportation infrastructure system will have," he said. "… I understand that this is not a perfect way to fund those needs but it is a way to fund those needs." The bill will need another vote in the Senate before it goes to the House. Only two weeks remain in this year's session. The TRIP report also put an emphasis on the finance of transportation, analyzing state and federal funding problems and noting that more than $500 billion in goods is shipped in and out of Missouri each year, usually via roads. The Missouri Department of Transportation has been warning for years that declining funding is limiting its ability to maintain and improve Missouri roads. Missouri Associated General Contractors president Len Toenjes called the report a “wake-up call” and emphasized that the report came from public data compiled by an independent group. According to Bonifas Kelly, TRIP chose to analyze Missouri’s transportation routes without being contacted or paid by anyone in Missouri. Both Horn and Toenjes reiterated the need for more state funding and touted the Senate bill to raise the state’s gas tax.